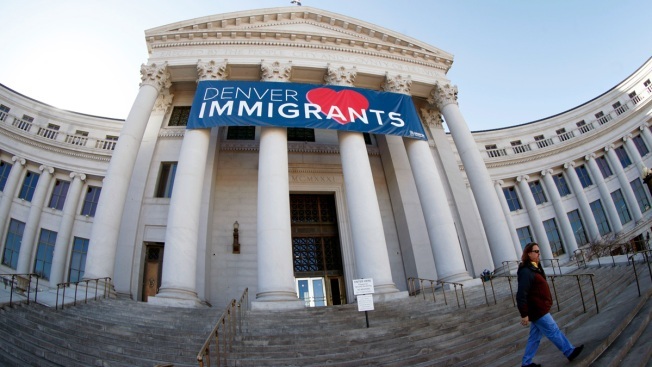 In this Feb. 26, 2018 file photo, a banner to welcome immigrants is shown through a fisheye lens over the main entrance to the Denver City and County Building. The U.S. Justice Department told The Associated Press at the end of February 2019 that 28 jurisdictions, including Denver, that were targeted in 2017 over what it considered "sanctuary" policies have been cleared for law enforcement grant funding. In most cases, courts chipped away at the crackdown that escalated in November 2017 with letters from former Attorney General Jeff Sessions to 29 cities, metro areas, counties or states it considered as having adopted "sanctuary policies" saying those policies may violate federal law. 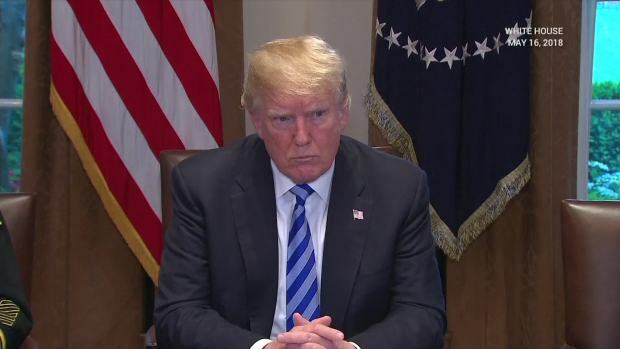 President Donald Trump railed against immigration policies adopted by so-called sanctuary cities at a White House roundtable Wednesday, bemoaning a California law that restricts local and state cooperation with U.S. Customs and Enforcement agents and calling some immigrants "animals." White House press secretary Sarah Huckabee Sanders doubled down on the comments, saying the president's language was not tough enough. "State and local law enforcement agencies already are stretched thin, and withholding these federal grants only makes their work more difficult," Leahy said in an email to the AP. "It's unthinkable that the Trump Justice Department would hold these funds hostage over an unrelated dispute on immigration policy." The conference's litigation is now focused on making the order affecting the 2017 grants permanent and apply to 2018 grants, as well, said Kate O'Brien, a Chicago attorney who represented the mayors. The Trump administration has long argued that places that don't cooperate with federal immigration authorities, often called "sanctuary cities," pose a threat to public safety. A day after the Department of Justice sued California over its sanctuary city laws and Attorney General Jeff Sessions scolded Oakland Mayor Libby Schaaf for alerting undocumented immigrants about possible ICE arrests, President Donald Trump called her a “disgrace.” Jodi Hernandez reports. "I continue to urge all jurisdictions under review to reconsider policies that place the safety of their communities and their residents at risk," Sessions said in a statement in January 2018. "Protecting criminal aliens from federal immigration authorities defies common sense and undermines the rule of law." The details differ by jurisdiction, but the Justice Department felt law enforcement agencies in those communities weren't sufficiently committing themselves to cooperating with federal immigration agents when officers came in contact with people who might not be in the country legally. 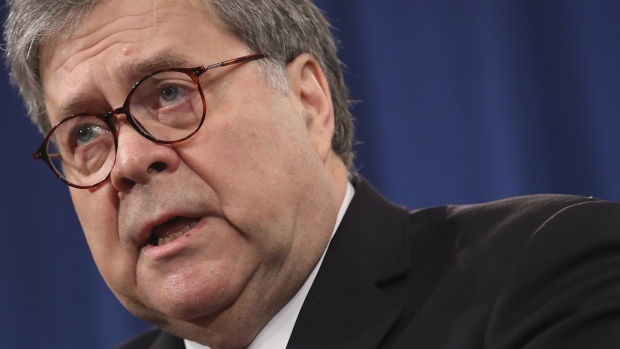 Some, but not all, of the 28 jurisdictions were cleared for the grants without changing the policies that triggered the original concern from the Justice Department, now led by Attorney General William Barr. And not all of the places actually have the money in hand yet, or have been told they've been cleared to get it. "It will be incredibly helpful," Martinez said. "I can tell you there's been a high level of frustration from people on both sides of the issue." In West Palm Beach, Florida, the Justice Department was concerned about the wording of a city resolution dealing with police investigations involving citizenship or immigration status. A year ago, a memo was sent to city employees saying they "may" share information with federal authorities. "So no funds (were) lost on our end," said police Sgt. David Lefont, noting the total was less than $100,000. 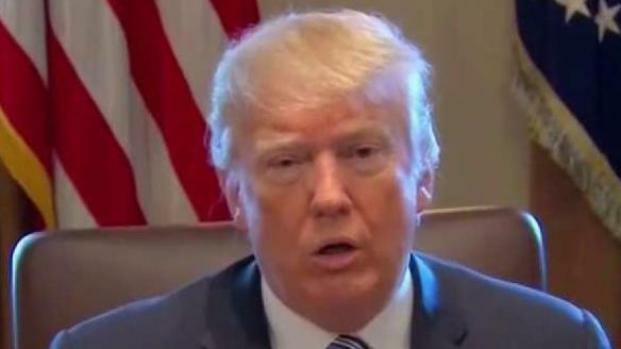 "What it looks like to me, the Trump Administration is not able to fully enforce cooperation with ICE (Immigration and Customs Enforcement) to the extent they would like to, but it is able to fully enforce compliance with existing federal law that some sanctuary jurisdictions have had to change their policies in order to get their money," Vaughan said. "The court in our cases, and in similar cases throughout the country, has found the attorney general is not authorized to impose these conditions," said O'Brien, the attorney for the mayors' group. Even before the 2017 letters were sent, federal courts across the country had begun to rule against the Trump administration's efforts. And they continue. Oregon, the only one of the 29 jurisdictions not yet cleared for the 2017 grants, last fall filed its own lawsuit against the Justice Department. The lawsuit, which also covers grants for 2018, accused Trump and Matthew Whitaker, acting attorney general at the time, of trying to "impermissibly commandeer the resources" of Oregon and its largest city, Portland. "For years, these grants have provided millions of dollars to law enforcement in Oregon," Rosenblum said in November. "But, suddenly these public safety funds have been withdrawn because Oregon will not submit to U.S. DOJ's demand that Oregon participate in its immigration enforcement efforts." Contributing to this report were Associated Press writers Eliot Spagat, Paul Elias, Susan Montoya Bryan, Andrew Selsky and AP News Researcher Jennifer Farrar.